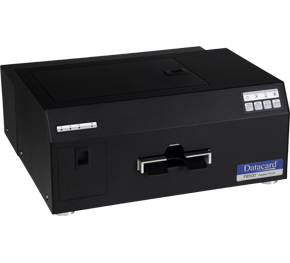 The Datacard SP75 Plus card printer is a dye-sublimation printer that provides in-line, dual sided printing and laminating. Paired with enhanced performance and improved card quality from Datacard Certified Supplies, which includes ribbons and laminates that contain radio frequency identification (RFID) technology, this printer assists in meeting security requirements for the issuing agency. This flexible RFID technology used by the printer (but not contained in the produced cards) works with many laminates which offer state governments unique security features that meet Level One, Two and Three inspection requirements, help provide tamper evidence and assist in the detection of fraudulent documents.